Building multilingual sites with WordPress and WPML is easy. The additional control with WYSIWYG Content Blocks, powerful visibility control over widgets and sidebars you get with Widgets Control and its compatibility with WPML (1) make it a very powerful combination. WPML lets you translate pages, posts, custom types, taxonomies, menus and even gives you control over plugin and theme text translations. Widgets Control is a toolbox that allows to manage the visibility of widgets, whole sidebars, sections of content within your pages and posts (and other post types like products, events, …) and it provides WYSIWYG Content Blocks that can be used with widgets, sidebars and shortcodes. Providing an ample set of conditions, Widgets Control allows you to restrict where sections of content, widgets or even complete sidebars will be displayed. Combined with WPML, it allows to show these based on language(s). Multilingual Content Blocks from Widgets Control combined with WPML’s translation features are a straight-forward way of providing dynamic, language-aware pieces of content that you can use and reuse in widgets or embed on your pages. You can show or hide a section of content embedded on a page for one or more languages. Hide or show a widget based on the current language displayed. You can use this to show a widget only for a certain language, for a set of languages or exclude it from being displayed on pages in one or more languages. You can show or hide a complete sidebar based on the language displayed. If you combine this with the advanced custom sidebars that Widgets Control Pro provides, you have a very organized way to manage language-based sidebars. Widgets Control provides WYSIWYG Content Blocks that can be used directly in sidebars. You can even embed these blocks on your pages using a shortcode. 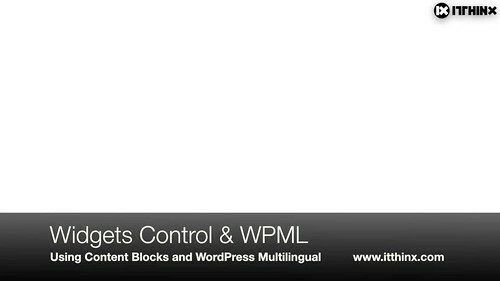 If you translate them with WPML, you have a quick and easy way to use multilingual content blocks. Enable translation for Content Blocks. Create a new content block with default content in English. Translate the content block into the languages used on your site. Add a Content Block widget to the sidebar where you want to display the new content block. That’s all you need to do, now you have a content block that automatically displays its content in the language used to view your site by your visitors. 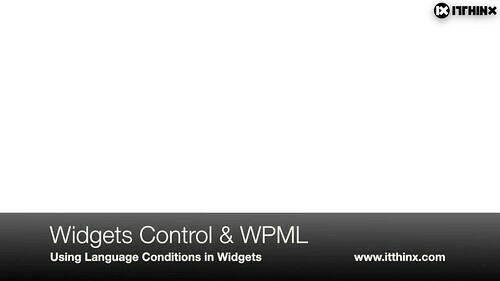 With Widgets Control you can display or hide sidebars and widgets based on languages. So for example, you could display a particular widget only for pages in English, or for posts viewed in Chinese and Japanese. This makes it very easy to provide variations that depend on the language or a set of lunges. The same thing applies to hide them: maybe you want a widget that never shows when your visitors view your site in Spanish or Portuguese. Widgets Control with WPML makes that ridiculously easy. Add the widget to a sidebar. And if you need to go a step further, Widgets Control Pro even allows you to combine conditions with exclusions. How about showing a widget only on content viewed in English but not on pages? Consider it done with WPML and Widgets Control Pro. Thanks for reading! If you have questions, please feel free to post your comment below. (1) Widgets Control is compatible with WPML and has been tested by the WPML Team. Widgets Control Pro is the premium version whose features include extended support for post types, page hierarchies, roles and groups, advanced conditions with exclusions and custom sidebars.